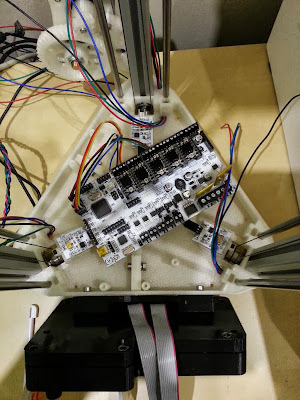 This is Part 3 of the 3DR RepRap Delta printer, in this post we will look at the final assembly and electronics, setup and wiring. 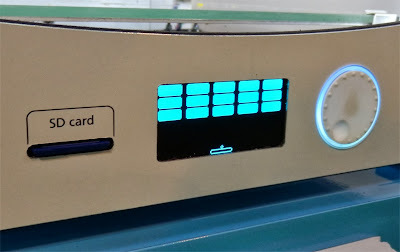 Firmware, settings and calibration will be in Part 4 very soon. In Part 2 we looked at the preparation of parts, how the printer is assembled and stringing our Spectra Line drives. Firstly thanks to everyone - I have had hundreds of messages and e-mails about 3DR, I'll do my best to get this build log done as soon as possible. And do keep in contact and let me know how it's going for you. The 3DR Forum thread is going really well, lots of help and advice for people building 3DR, and alternative designs starting to emerge too. 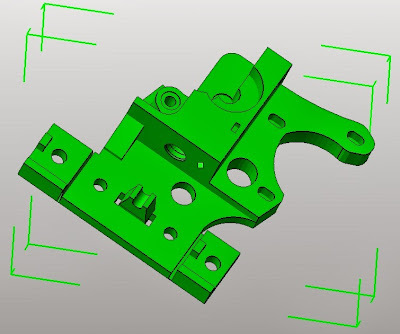 Other threads to be aware of - 3DR Simple, by JohnSL - a simplified 3DR being re-designed in Solidworks. 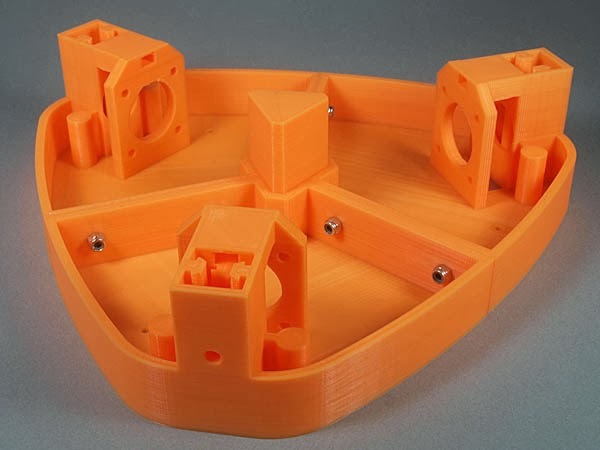 JohnSL is doing some really cool stuff, splitting it down into even smaller parts to be printable on a PrintrBot simple. Richard Gain now has his 3DR up and running - his Blog here Richard is build a tall 3DR and also has a good break-down of costs for 3DR on his Blog. Photo by Luke Turner - Luke is using RAMPS electronics, so made small adapters to fit inside the top printed sections. Photo by Luke Turner - Luke's 3DR also has some *Super-Bling* LED lighting. 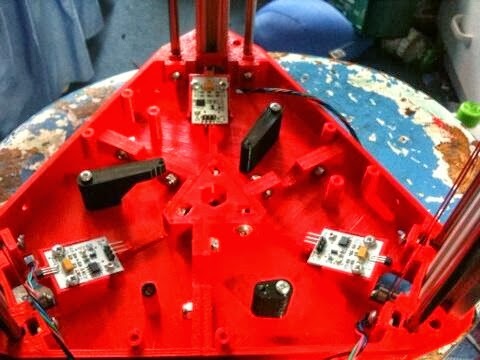 Zacbot is documenting his build over here on Eventorbot.com - another very nice job, thanks! 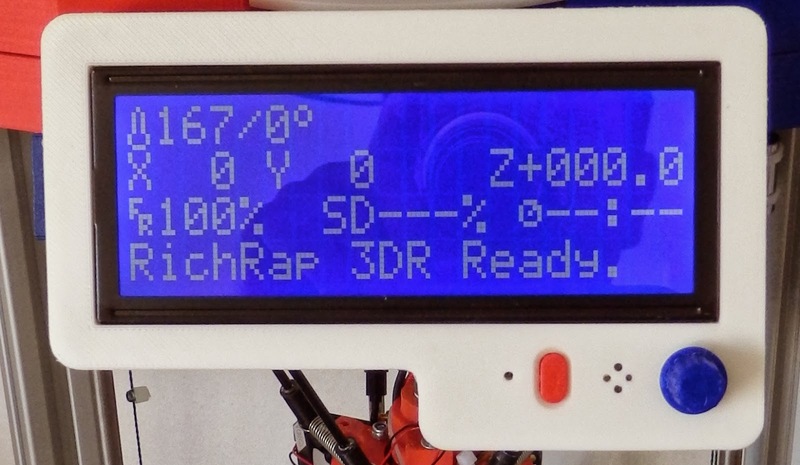 CidVilas - Has done a great job with a better BOM for 3DR - Google Doc Here and even created a rather nice cover for adding easier to fit electronics and a possible Raspberry Pi controller on the top rather than under. Nice! Photo by - German Palacio (FraNtik) build is going together well - and also some very good photo's of this build are available here. I'm sure there are also a lot more being built up - really nice job everyone! Do let me know if you have built up a 3DR! For most electronic sets you will require standard 0.1" crimp housings to be fitted. Common colour combinations are 'Red for +' 'Black for 0V (Gnd)' and 'Yellow/White for the signal'. It's important to check you have the correct orientation and are aligned with the three pins. End-stop wiring needs to be connected to the Positive (+) Axis connections on most electronics - note that some electronic sets only have one set of three end-stop connections. 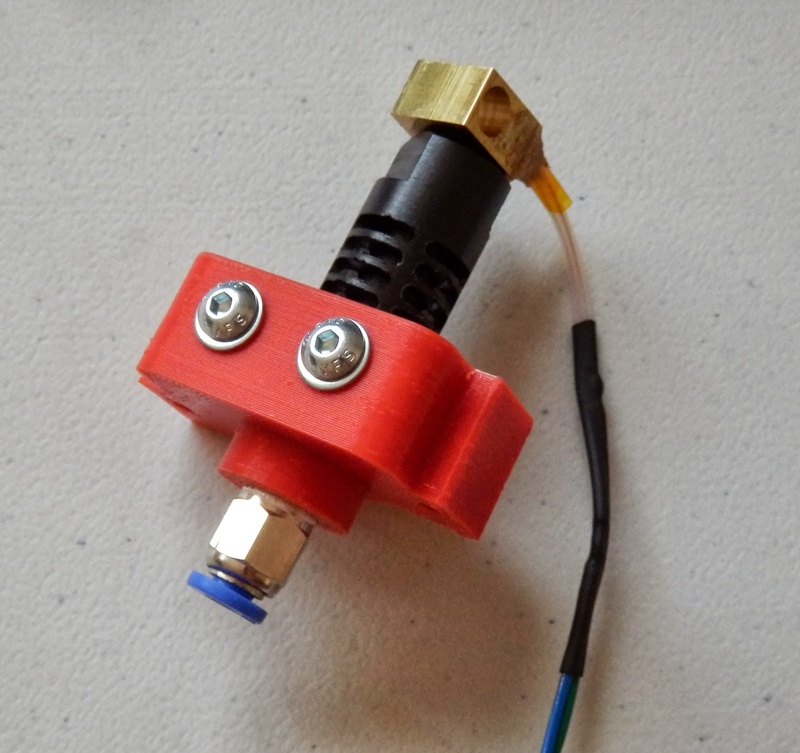 If you have to build and wire up your own hot-end, do take the time to fit both the thermistor and heater well and with a solid connection, Kapton tape on it's own is NOT a good enough solution to hold things in place. 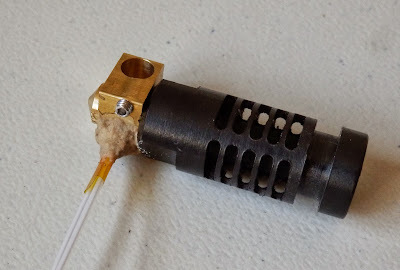 This is a standard J-head MKV from Hotends.com but I have added a small set screw to lock the cartridge heater in place and also secured the thermistor in place with fire cement. The mount will need a little drilling after the print, you need to drill out the hole for the filament - 2mm should be fine. Then drill through the 4mm holes, insert M4 nuts and use 16mm M4 bolts+washers to secure the hot-end in place. The Pneumatic push-fit is designed to self-tap and screw in place, if you find it's a bit tight, heat the mount with a hair-drier or heatgun, then tighten. Secure connections and as in photo above it's also a good idea to add a 2-way cable for a fan connection to help cool the hot-end. 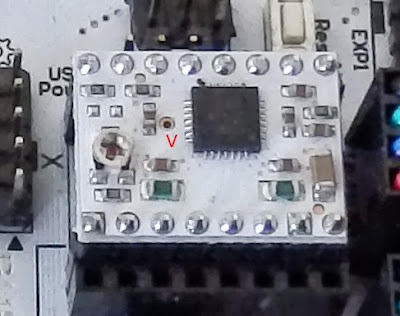 Thermistor connection goes to T0 on the electronics. Orientation is not important. 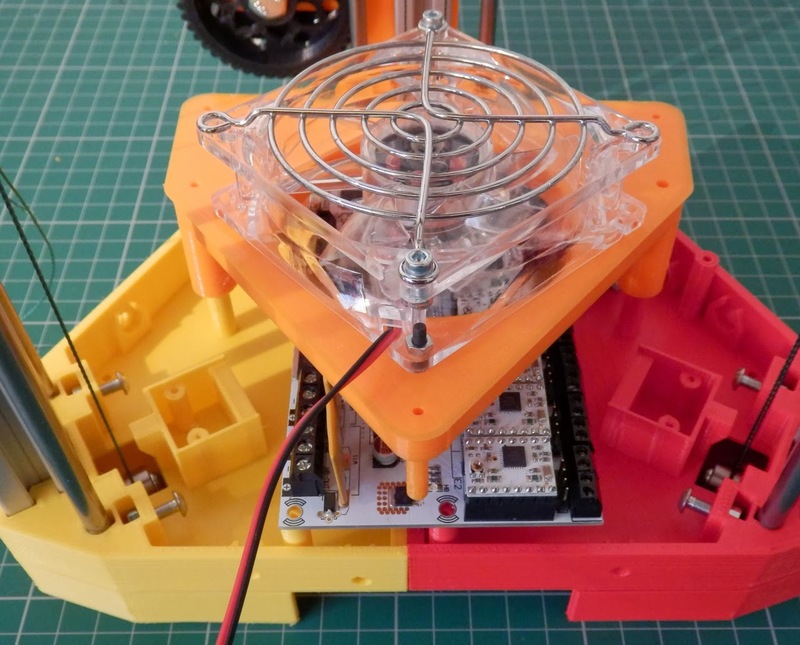 A fan for cooling the printed part can be connected to one of the smaller fan outputs - black wires - shown in middle of image above. 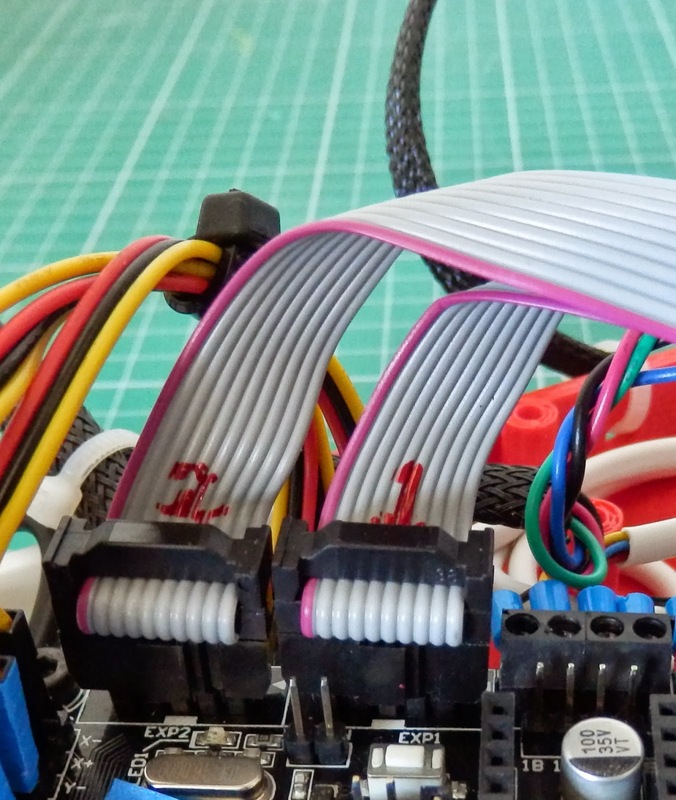 +12V Power for the board needs to have a good sized cable, we are not using a heated bed, but still the electronics will be taking around 4A whilst running, so if you have any connectors, switches or sockets for your power input, check the rating and use suitable cable. The fan for the hot-end is running all the time, it's purpose if to cool the cold-end insulator, you may decide not to do this or want a controlled fan on the hot-end to cool the printed part. RUMBA provides a few spare +12V connections for things like fans and lighting - above you can see to the left of the Heater connection a small 2way 0.1" connector, this is the one I am using for cooling the hot-end. 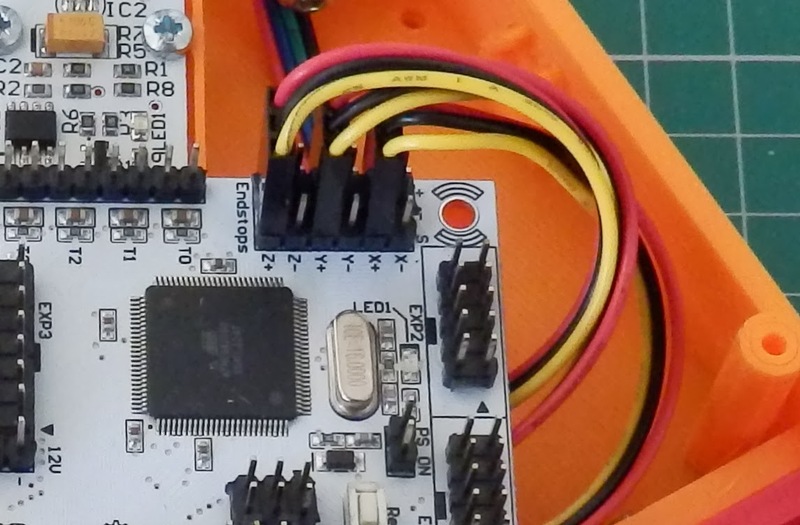 Make sure you have the correct orientation for the connections from the LCD, pin 1 (marked with a red cable) needs to be going to pin 1 on the RUMBA board (shown above) BUT connections from EXP1 and EXP2 from the LCD board need to be swapped over on the RUMBA end. 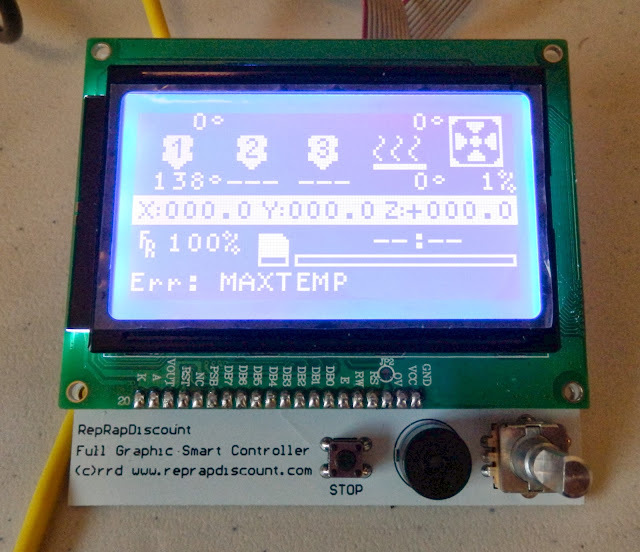 If you are using RAMPS or other electronics with the LCD_XL you should not need to swap EXP1/2 connections as they use an adapter directly for RAMPS connection. Other LCD display options are also available, above is the Full graphic module. 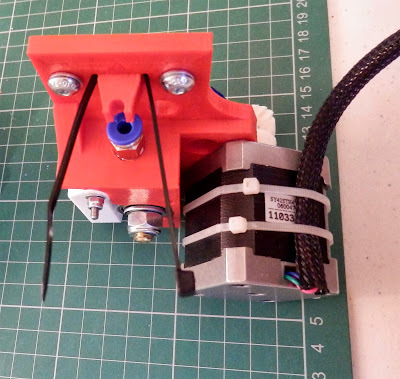 I still always use a geared extruder for all my printers, I have found this gives the best results for me with both Bowden and direct systems. 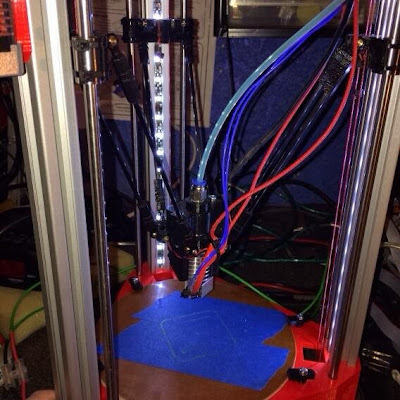 It also provides a high level of torque and fast retraction speeds. The Extruder is very similar to the design I did for Rostock, it's mounted slightly differently at the back of 3DR on the Aluminium frame using 2 x M5 16mm bolts. 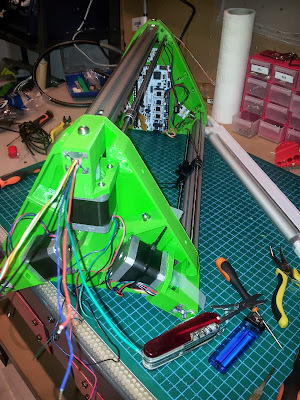 I did plan to have hinges to help stand-off the extruder, but I dropped it from the design in the final stages of getting 3DR up and running, that was a mistake as you will need to space the extruder body away from the Aluminium frame to stop the carriage hitting the big gear. I accidentally deleted this design after I printed a test part, it would have worked well, the 'flaps' fold around and help stand-off the extruder body away from the frame, apologies for this - I'll recreate it at some point. Assembly requires a Hobbed Bolt and 2 x 608ZZ bearings, M8 nut, M8 washers. 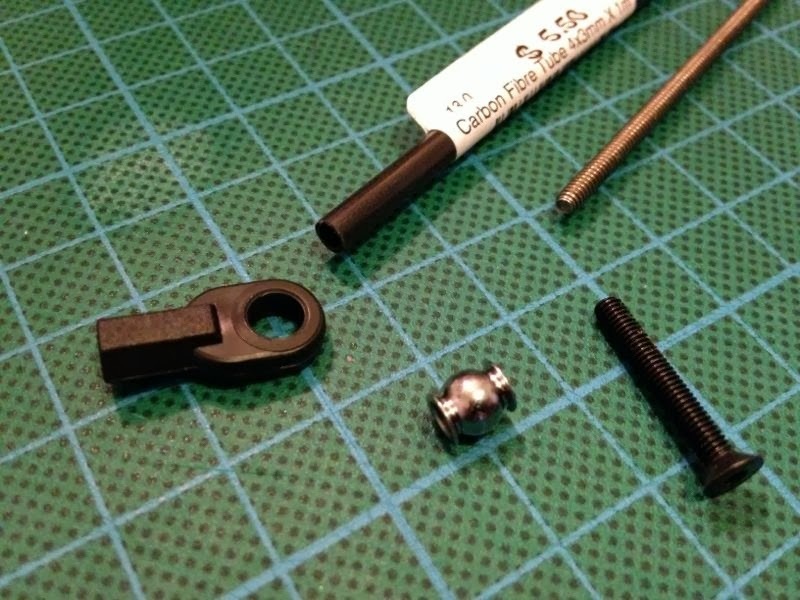 Hinge springs, washers and Long M3 bolts make up the final part of the extruder body. 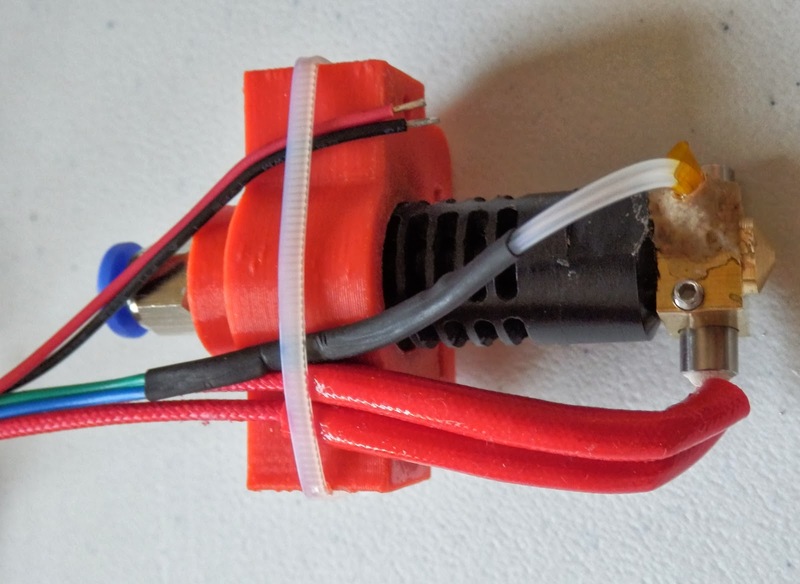 As with the hot-end if you have any issues fitting the Pneumatic fitting, use a little heat to soften the plastic and screw in tight. PTFE tube should be 4mm outer and 2mm inner, you will need a section about 450mm long (for a standard sized 3DR) fitted between the two push-fit connections. 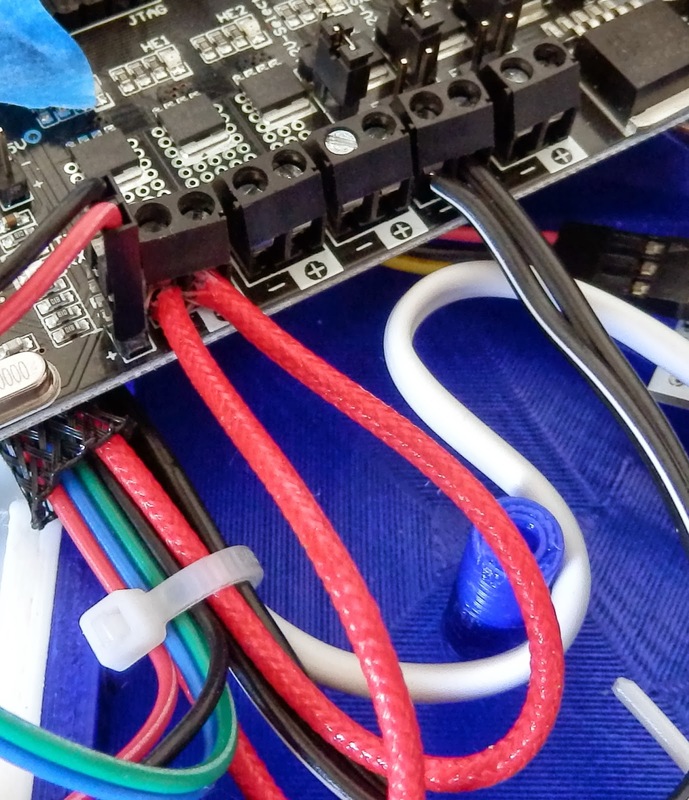 The RUMBA board has two sets of connections for Motor's - if your motors have pre-wired connections you may want to keep them, but I can recommend using the screw-terminals, if you do, then also use ferrules to help clamp the wires down and avoid damage. 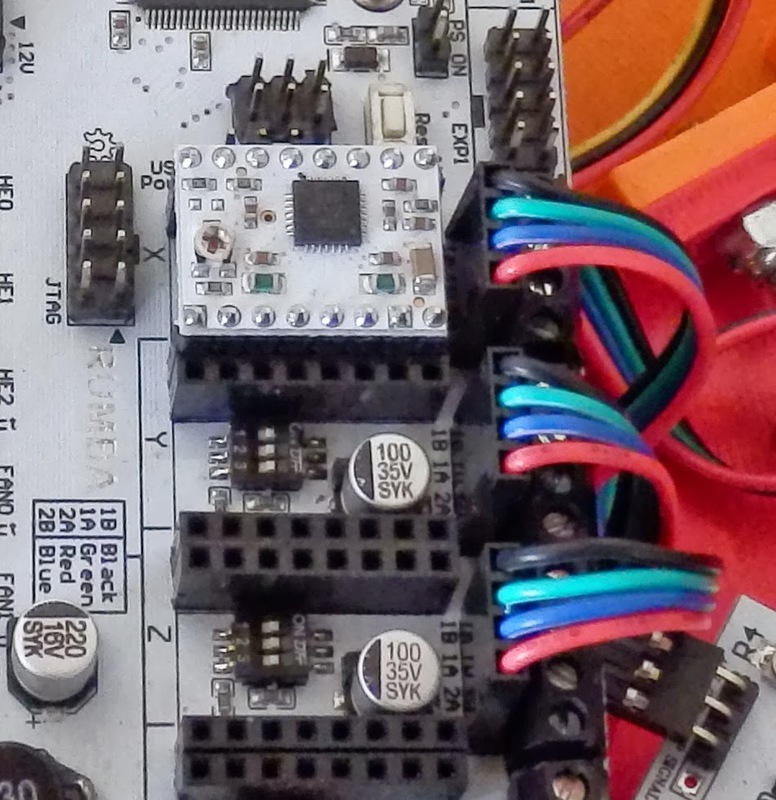 The use of heatsinks is advised on the Stepper drivers if you are not going to use any cooling. 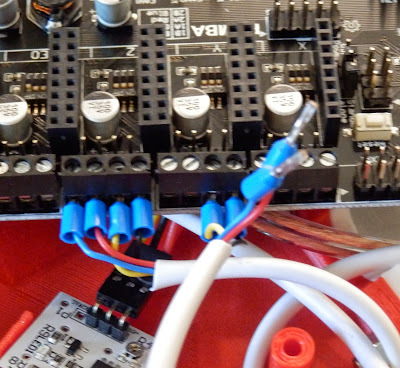 It's a good idea to set each of your stepper driver current limits before running with motors attached. In the above image the voltage reference point on a Pololu 4988 driver is marked with a red V, if you measure the voltage at this point and Ground (GND) turn the trimmer pot all the way down (counterclockwise) and turn back up clockwise until the voltage reads 0.45V you will have a current limit of around 1A. 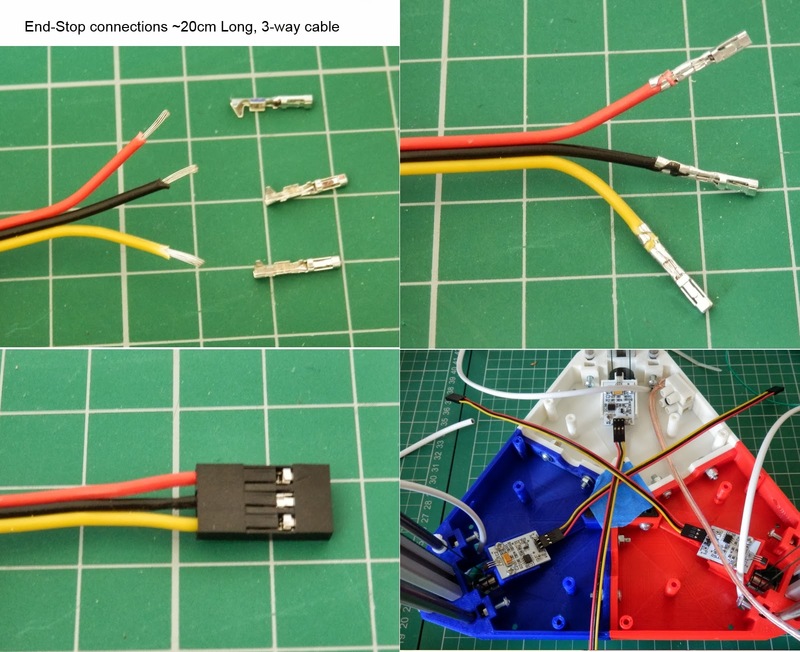 If you are using a Stepstick driver, these are already limited to around 1A, so you will normally need to turn the trimmer pot all the way around (clockwise) - Also note that Stepstick drivers are normally fine for X,Y and Z axis, but can sometimes struggle to provide enough current for extruders, I always use a Pololu based driver for extruders to ensure you can deliver more than 1A to the extruder stepper motor if/when required. I did make bigger fan mount for the electronics, but it was not required - I don't use a fan at all now for the electronics cooling, passive cooling seems to work fine. Note the LCD mount has an optional mounting points for a Fan to cool the electronics, if you need it. Another fan mount for part cooling is available on my 3DR source page, this can be really good for PLA printing things fast, like pots and small parts. Highly recommended printing at least one of them. 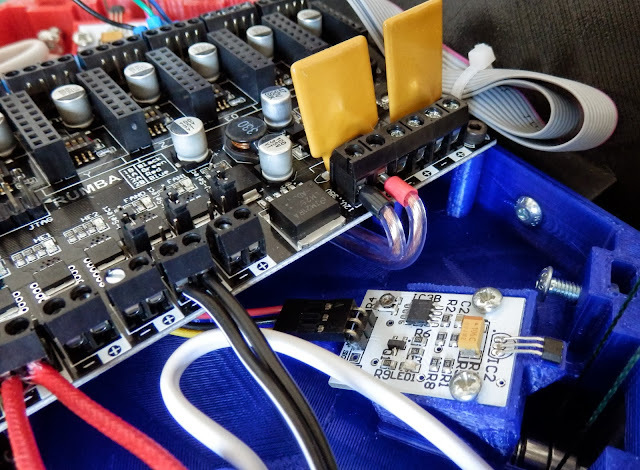 That's it for Part 3, I know it's a bit short, but I'm always unsure of how much to put on the electronics side as I have covered most things in my Blog before and there are so many options and choice for alternative electronics. Any questions, give me a shout. 3DR Part 4 is half finished and will also be up soon, if you want to download the Firmware and get stuck-in, here it is on my Github page. 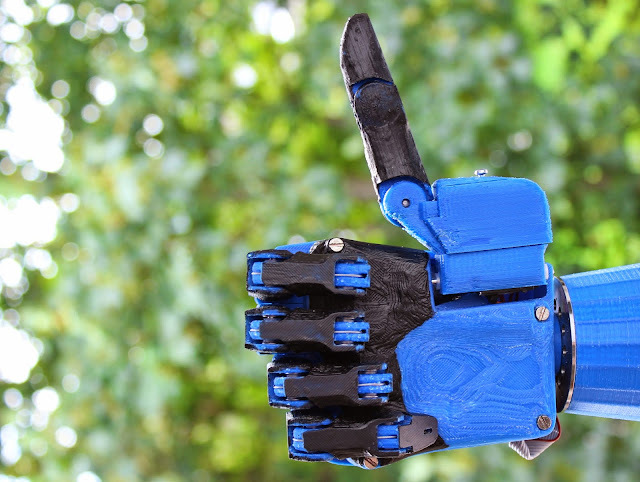 Firstly do take a look at the open Hand project running on Indiegogo - it's a great mission and they have almost reached their funding goal - Just another £9k to go as I type this. Please donate if you can. 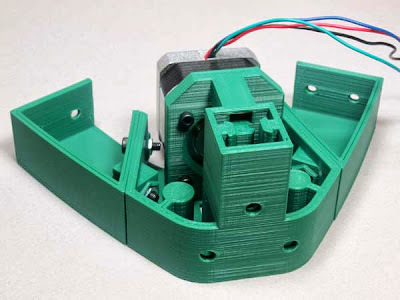 A great website with 507 mechanical movements was posted up on Google+ the other day, it's well worth a look if you want any inspiration for 3D printer design or just to see all the amazing ways to move and link things. And if you fancy something a little different, take a look at these Soft robots - interesting! We are back from the biggest Additive Manufacturing show in the UK and I must say it was absolutely fantastic! 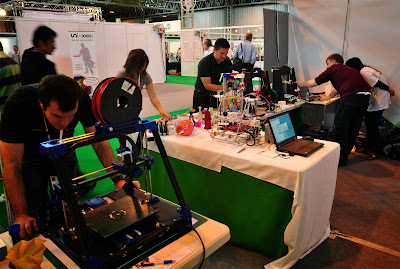 The TCTShow has been running here in the UK for 18 years, and I have attended the last 8, this year however was the very best so far, the show organizers had not only opened up the show to much more of the 3D printing, maker and designer communities, but they really stepped up with a massive presentation stage seating 400, recording of all the fantastic industry speakers during the two days and a great collection of 3D printed designer objects on display at the front of the show. The whole event was bigger, better and had a real buzz. Indications even before the doors opened pointed to this being a really busy show, by 4:30PM on the first day it was still packed with visitors. Normally after the 3:00PM parking validation you see a mass exodus from these sort of 'industry' trade shows. 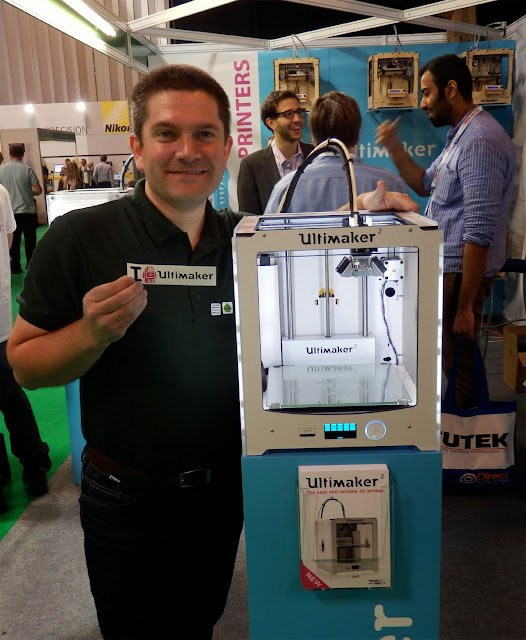 This year it was quite different with a wide mix of individuals and companies representing all avenues and niche's of the Additive Manufacturing industry. And if anyone out there is interested to hear more about any of the things I mentioned in my presentation, do let me know. 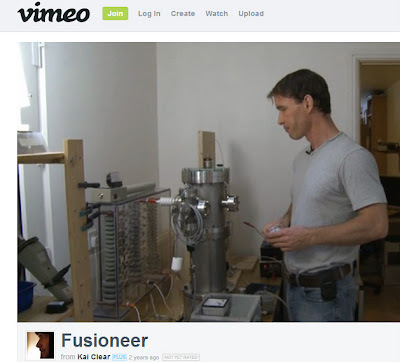 One rather stunning project I talked about was nothing to do with 3D printing but is another amazing example of what makers and inventors get up to in their spare time, that was the Fusioneer project by Dr. Jonathan Howard - this is basically a self made fusion reactor! If you have time, do take a look at the 20min Documentary on his 3 year project here. 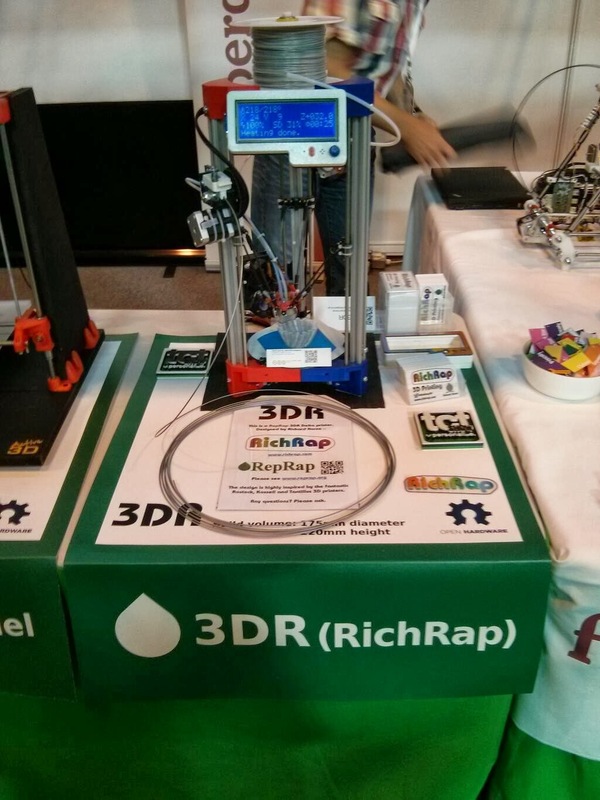 This post is just a taster of the event, you will find a full review of the TCTShow in the next issue (3) of the RepRap Magazine. We will also have the results of the Issue 2 Print for Life Competition and lots of other great stuff too. After a busy set-up day we were all set for the show opening. Within half an hour of the show being open we had a steady flow of people to the stand, by mid-day we were totally swamped with people, this continued all day and for the entire second day! 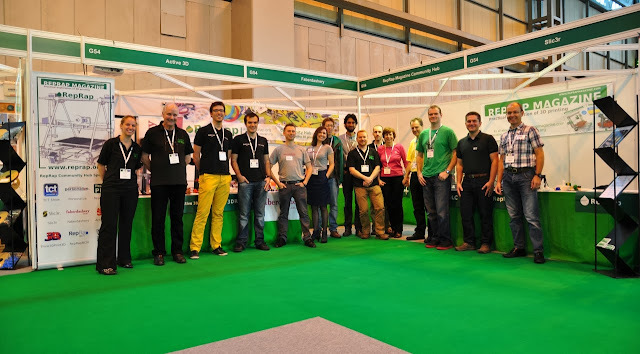 We had quite a large stand compared to many others, but even this was no where near enough space as we were often 6 or more people deep and at times, we could not really get on or off of the stand, but that's great!. We were also lucky that an exhibitor opposite us had pulled out, so we ended up with some standing room for people waiting or just a way to get past! We would have blocked the corridors solid otherwise. 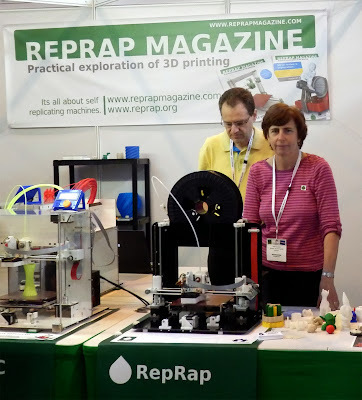 RepRap Barcelona - The RepRapBCN team were fantastic, we all had a real blast from the moment they arrived carrying two stunning and solid new 3D printers to the end of the show, I can't wait to see them all again soon. Faberdashery - Clare, Andrew and the team added magic, colour and style to our community stand, their unmistakable and rich coloured PLA was being used throughout the event, with stunning objects on display and fantastic advice for anyone who asked. 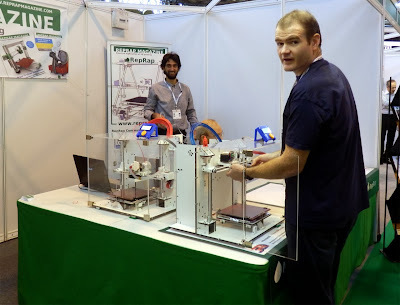 I had my 3DR printer next to Faberdashery, and I just want to thank Clare and Andrew again for answering hundreds of questions about my machine while I was off the stand for one reason or another. 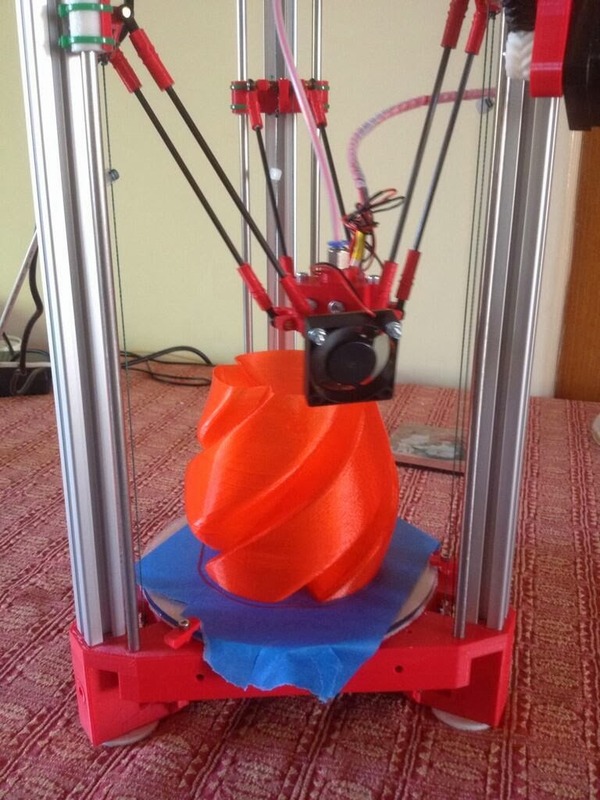 Think3DPrint3D - Tony and Roland had two of their very new Mendel90 Laser-Cut machines running. 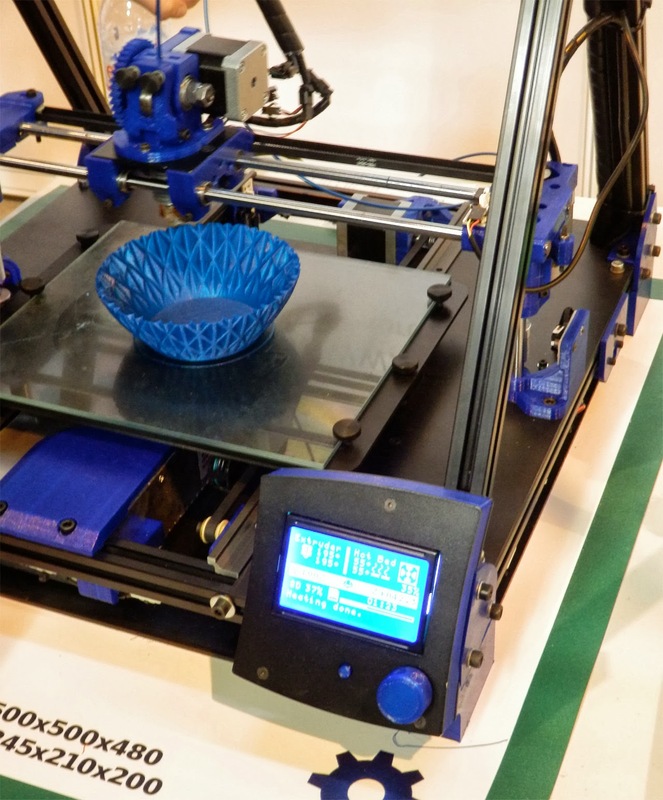 These machines have an optional enclosure that can really assist with big ABS prints. It was inspiring to hear how Tony and Roland have built up their business and they certainly have some very exciting things coming out soon. 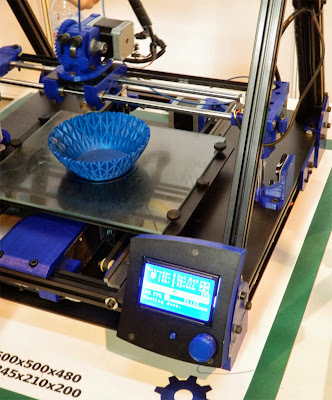 NopBotShop - I was so delighted that both Chris and Mary from the NopBotShop could make the show, and also bring along the stunning black Di-bond Mendel90 that Chris (Nophead) designed and developed from scratch. Reading Chris's Hydraraptor Blog was one of the main reasons I became interested in doing RepRap development, so after all these years it was so nice to finally meet Chris and Mary. Slic3r! - Another amazing person to meet was Alessandro, it was a true honor to meet up with Slic3r's creator, so many new and cool things are coming soon, it's going to be another great year for this fantastic piece of essential RepRap software. 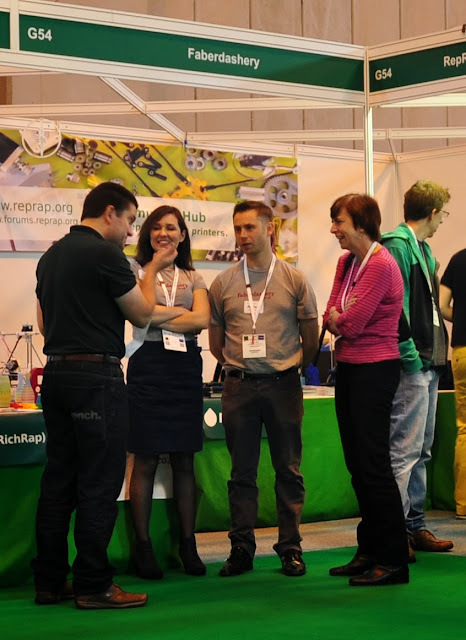 RepRapPro Ltd. - The whole team were at the NEC this year! 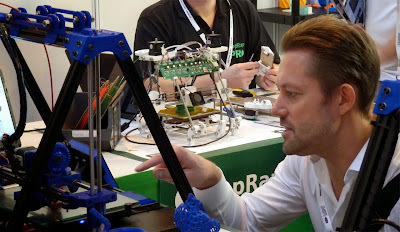 They also had so much to show that RepRapPro decided to take another stand right next door to us. 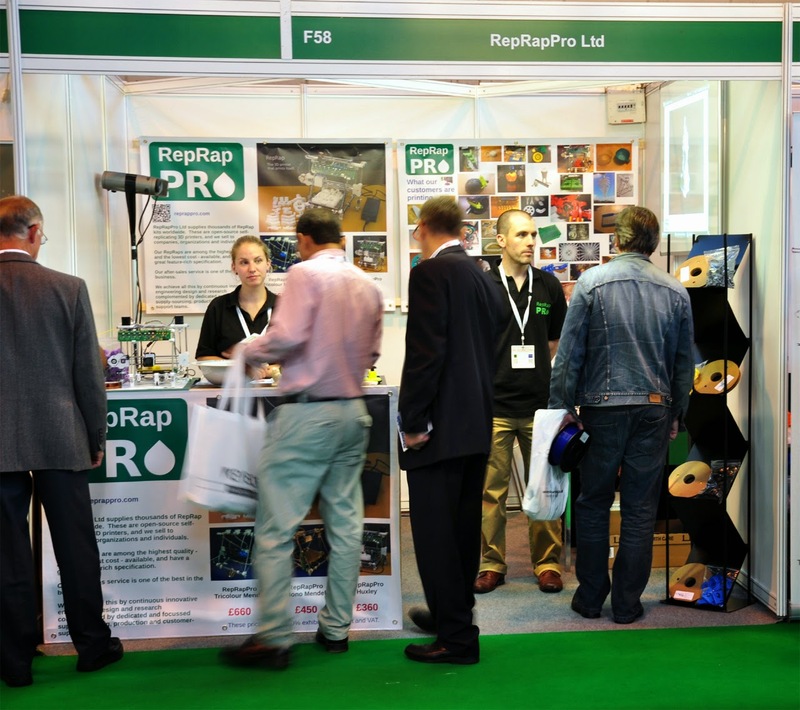 This proved a very wise move due to the massive attention both our stands were drawing from the show's visitors. RepRapPro built up a Huxley from a kit on the community hub stand and demonstrated the entire range of machines and options on their stand. Again, RepRapPro have some great developments in the pipeline, keep an eye out! 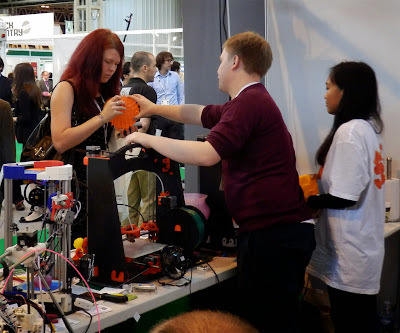 Active3D - Justin and the team from Active came fully tooled up with machines and a collection of more 3D printed things than I have seen in a long time. Justin described the event - "As good as a family Christmas! Thank you, Amazing" - I totally agree. 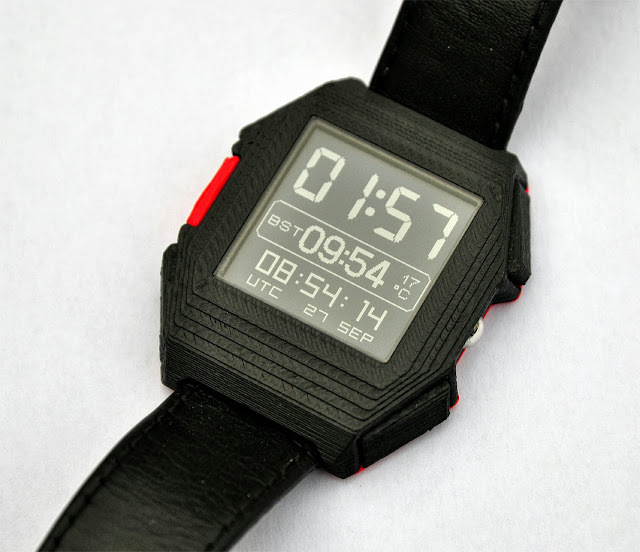 Hamish Mead - Hamish is the inventor of the world's first open source time machine... OK, it's a watch, but a really, really stunning one, everything is fully designed from scratch, including all the electronics, hand-built and featuring a 3D printed case. Richard Horne - (That's me!) 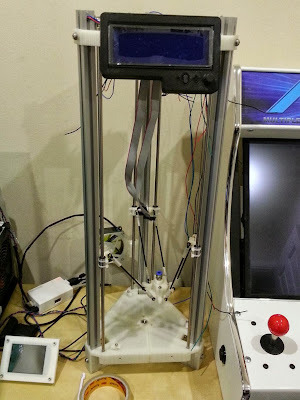 - well, you know who I am, I had my 3DR and recent Prusa i3 build on display. 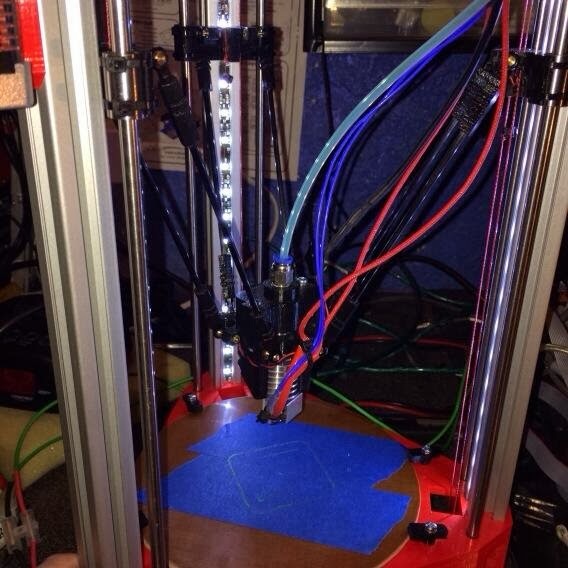 3DR was in full flow printing some simple pots using my ultra easy dual mixer hot-end. I didn't get time to print all that much else unfortunately. It was really interesting, seeing so many big names under one roof and we also had a wide range of presentations and speakers to see during the two days. It was truly great to meet Todd Grimm and Joris Peels, who both helped me relax a little and provided great advice before I went on stage to present in front of around 400 people. Both Todd and Joris have a wealth of experience in additive manufacturing and offered huge insight during the show and in their own presentations to a packed out crowd. One presentation I wish I could say I will never forget was from Jeremy Pullin (@jezpullin), Jeremy is the Rapid manufacturing manager for Renishaw. I was not quite expecting such a spectacular display. It was very much like seeing a really good comedian on stage, but upon waking up the next day you remember that you had a great time but have forgotten all the jokes. I felt this way after Jeremy's presentation, and I'm still trying to recall now what was said. Maybe it was the shock, I was clearly not prepared. just to give you a taster - Jeremy started off by Glassing himself on the forehead live on stage, then attempted to kill someone on the front row with a scented candle! - after that, it was a bit of a blur, but a lot of extremely good points were raised. 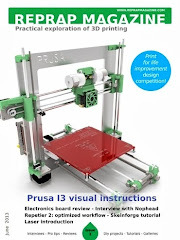 I'm sure the entire home 3D printing and maker community was directly insulted at one point with a reference to masturbating over the new Dr Who assistant... It was all very good stuff and if it ever makes it onto the internet you may even be able to check out what you missed. As Duncan Wood quite rightly said - that will go down in legend! Loads of other things to see and do at the show, but I'll save them for the next RepRap Magazine issue. Lets just finish off by saying we had a lot of fun! 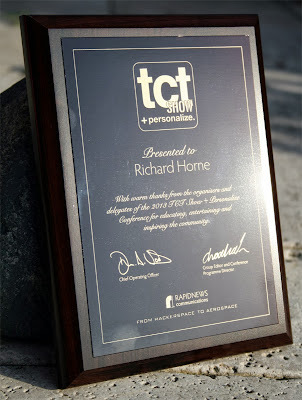 If you want to read more about the show, take a look at the TCTMagazine and Personalize. You may have noticed a lack of comments about the bigger companies and 'professional' products, that's basically because very little has changed, both in the technology offering and the attitude towards licensing. I was quite disappointed to see designs and models being used without any sort of attribution, but unfortunately not surprised. Many of the bigger players in this industry are still playing by different rules, and until that changes it's going to be hard to see how the communities, makers and designers can really collaborate with them. I'm still hopeful that things can change for the better, but regardless we are setting our own path. Rachel Park covered wider aspects of the show in her recent article for 3DPI here - Well worth a read. The RepRap and maker community already plan to be back bigger and better next year, the TCT Show is moving to a 3 day event, they have also signed up to be the 3D printing voice of CES (Consumer Electronics Show) in Vegas and London next year! - that's massive news. If you want to take part in the TCTShow 2014, we are already making plans, with your help and support it could be really big, really, really big! 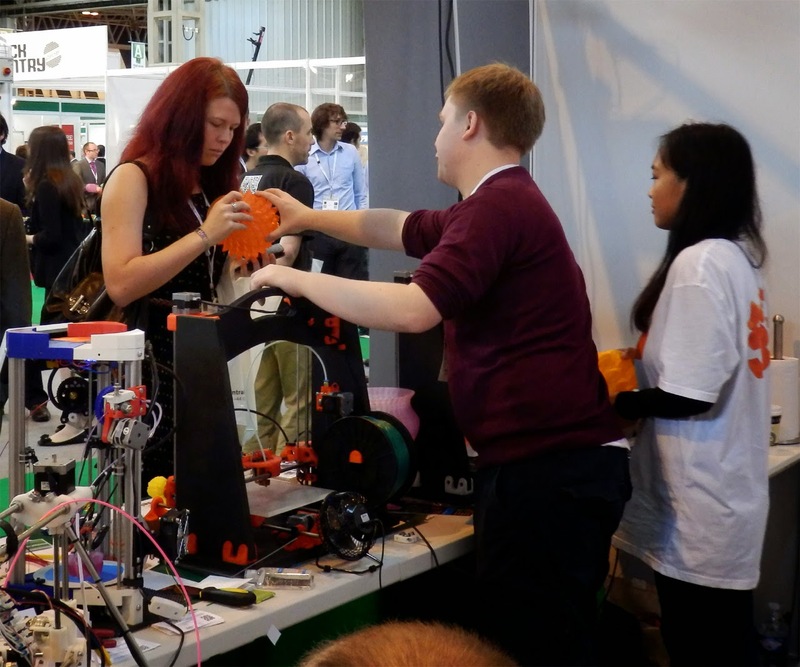 - If you want to know more as soon as we do or wish to take part in next year's event, please e-mail me at tctshow@reprapmagazine.com and I will keep you updated. Finally a really massive thank you to all the show organisers, Personalize, TCT Magazine and everyone who helped make this show a total success. 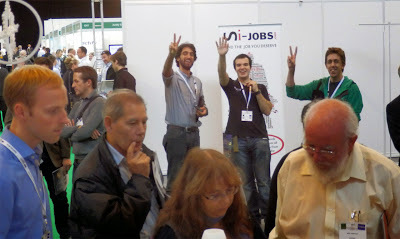 Also not forgetting all the many people who visited us, shared ideas, failures and successes. It was great meeting each and every one of you. The TCT and Personalize team at thought of everything, and I was rather pleased to receive this gift of appreciation for presenting at the show. From Hackerspace to Aerospace - you guys totally rock! - can't wait for next year. RepRap really is a special project to be involved with and would not be the same without all it's fantastic and enthusiastic members!